Blogger is a free blog publishing service that is provided by Google. It is easy to set up and use without requiring any extensive computer knowledge. It is a great place to start if you don’t already have a web presence. You can be up and running with a new Blogger site in only a few minutes. To create a Blogger site, go to google.com. In the top right corner, you’ll either see your Google Account avatar or a Sign In box. You’ll need to be logged into your Google Account before going any further. If you don’t have a Google Account, click on the Sign In box, then select Create an Account. 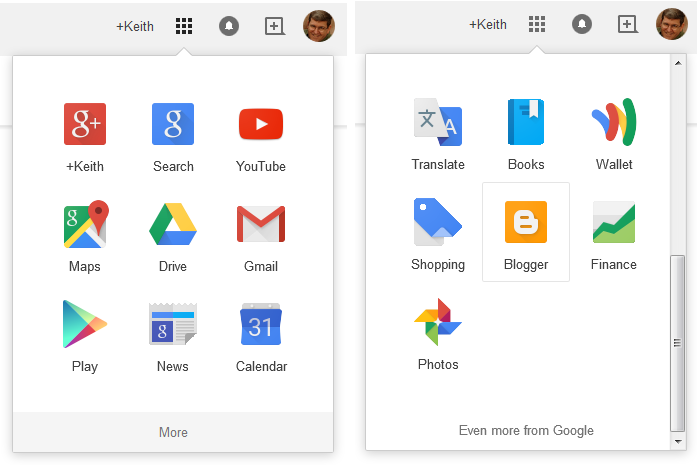 From the Google search page, click on the Apps icon. It sort of looks like a box made up of three rows of three smaller boxes. Select Blogger from the list of apps that are displayed. In most cases, Blogger won’t be displayed at first, and you’ll need to click on the More option at the bottom of the list to display the next page. 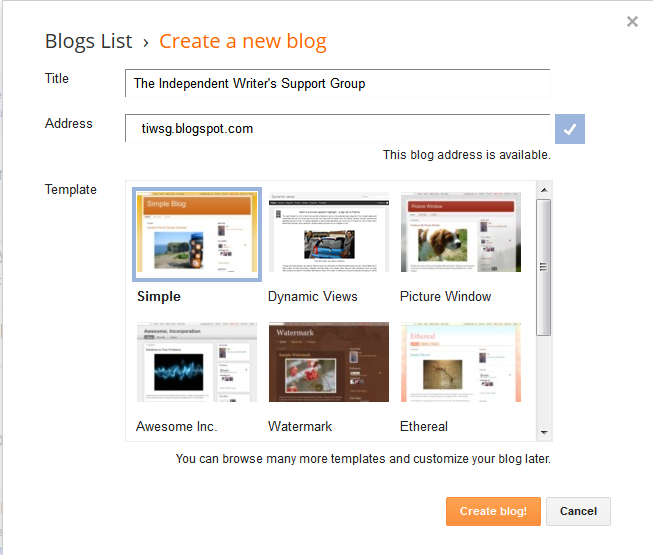 From the Blogger page, you can create a new page or add to an existing page. For now, we just want to create a new page. Look for the gray New Blog button and click on it. This will display a window where you need to do three things. Enter a title: Your title is what will appear at the top of the blog page. You can change it later if you don't like it, or you realize that you made a typo when you created it. Enter a URL Address. This is how readers will get to your site. It will be something followed by blogspot.com. Try to pick something easy to remember. You can also change this later. Pick a page template. You may be tempted to spend a lot of time looking at the different templates. Save that for later. Pick the simple template for now. Once you have some content on the page, then you can look at all of the template options. It's easier to customize a template when you can see how it looks with your material instead of a default sample. 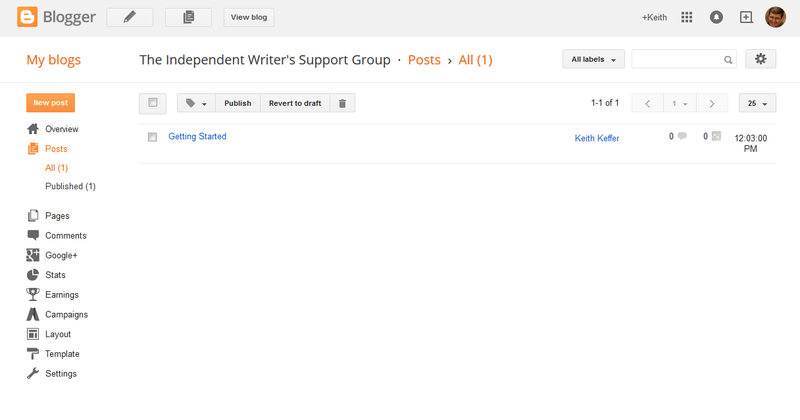 The screenshot above is from the blog page that was first set up for The Independent Writer's Support Group. If you are creating an author page, your title and address should include your author name. When you are done filling in the information on the Create a new blog page, press the Create Blog button to continue. You'll see a list of the blogs that you have created so far. As this is your first blog, you'll see only one item in the list. From this list, select the View blog button to see what your page looks like right now. There probably isn’t much there yet. Just your title, and maybe a Google+ profile if you have one. At the top of the page you'll see a menu bar. Whenever you view your page, and you are logged into your Google account, you'll see that menu bar. That will be your starting point for editing your page. There are two important options in the menu bar. New Post - Click on this to start writing to your blog. A post is an article that will appear on the first page of your blog. Design- Click on this to change how your blog looks. From the design menu you can add new pages, change the color and layout of the blog, and add or remove widgets from the site. We are going to start by creating a simple post. Click on the New Post option. You'll be taken to your post editor. There are only two things that you need to do when creating a post. First, enter a title. Second, enter the body of the article. Here is what we used for the first post on The Independent Writer's Support Group. In the example above, the title is "Getting Started" and the body is "Welcome to The Independent Writer's Support Group! As you probably can tell, we are just beginning to set up the site, and there isn't a lot of content yet. Don't worry, that will change." Change the site name, and you can use the above example on your own page. Don’t worry about all of the bells and whistles at first. Once you have something written, go ahead and click on PUBLISH. That will save the article and put it on your page. If you have a Google+ account, you might get the “Share on Google+” page after you publish. Clicking SHARE puts it on your Google+ stream. Clicking CANCEL doesn’t. If that doesn’t make sense, click on CANCEL. As this is the first post on the page, I’d probably click CANCEL and save the sharing until I have some more meaty content. After publishing a post, you are taken to the design page. If you want to see what your page looks like, click on VIEW BLOG on the menu bar at the top of the window. Go ahead and click on VIEW BLOG now. That's it. You now have a web site where you can share whatever is on your mind. This is only the beginning though. There is so much more that you can do with your site than just blog posts. From the Design Page you can select new option to customize your blog site. What follows is a quick highlight of some of those options that might be useful when you first get started. Posts - This is where you can create new articles, or edit existing ones. Pages - Pages are static content that don't change. For example, this article is a page, not a post. Pages don't automatically appear on your blog. You will need to point to them if you want a reader to find them. Like posts, the Pages option allows you to create new pages and edit existing ones. Comments - With this option you can review comments and decide if you want them to appear on your website or if you want to delete them. Google+ - Remember that Google+ share box that you got. You can turn that off from this screen. Just uncheck the box “Prompt to share after posting” I wouldn’t automatically share, at least starting out. Once you have mastered the blog, you may want to turn this feature on. Stats - Select this option to get an idea of who is looking at your blog. Don't be discouraged if the numbers seem small at first. It takes time to build an audience. Creating a website is the first step. Settings - You are probably going to be OK with the default settings, but you should still take a look and familiarize yourself with the layout. From here you can decide if your blog is public or private (by default it is public and probably should stay that way), whether you want to allow comments, and what time zone you are in. Earnings - If you set up a Google Ad Sense account, you can place ads on your page and maybe make a little money on the side. This might be something to consider once you have some content and a feel for your audience's tolerance for advertising. The first job of your website is to allow you to connect with your audience. Campaigns - You can also promote your blog through Google Ad Words. This will cost you some money. Whether it provides any value will depend on what your goals are. Random people viewing your blog probably won't help build an audience. Layout - This is where you can change what appears on your website. You can add content to the sidebar, create a menu, link to other sites. You can also remove content from the sidebar. For example, I removed the Google+ profile information from the sidebar for this website. If you want to add an image to your title box, you will do that from the Layout menu. Click HERE to learn more about your website layout. Template - If you want to change the general look of your site, this is the place to go. From here, you can change the color and overall layout. Google provides a number of templates that you can preview.